Mr. J.A. Foster, M.L.A. 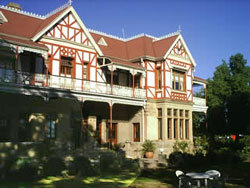 (1904), local Oudtshoorn attorney, asked Mr Bullock to design a double storey manor house in 1902. The building was erected in the Tudor-Bethan style with the lower level of local dressed sandstone and the top storey of burned bricks and the inner walls of mesh - plastered panels by Mellville Brown Jnr. Across the central section and at either end, are double-storied verandahs with cast-iron railings. The gables are false - half timbering. The main features of the front elevation are the flight of stone steps and encaustic tiling upon the floor of the front stoep. The window fan-lights and door panels with the lily motif are of stained glass. In the hallway the 'dado' is of teak panelling. A teak staircase with heavy lion-carved posters leads to the top storey. The ceilings and dados are of geometrical papier mÂché pressed patterns. The Municipal valuation in 1907 was £10,500.12. In 1915 the Teachers' Training College was founded and in July, 1916 the building was hired for £300 per annum from the Standard Bank out of the insolvent estate of Mr Foster. The building was used for this purpose till 1924. Later it was used as a Girls' Hostel for the Commercial School and as school offices. In 1972 the building was evacuated and rapid decay is taking place. The school committee in co-operation with the local Historical Society and members of the Foundation Simon van der Stel have submitted a petition to the authorities for the conservation, restoration and declaration of the building as a National Monument. In 1973 the administrator temporarily placed the building on the declaration list.